Description: PN1 commercial grade aramid fiber honeycomb is manufactured from Meta-Aramid paper and coated with a heat resistant phenolic resin. • Long shelf life. The mechanical properties referenced are maintained for 10 years minimum if not exposed to moisture, weather or any normal hazard. Applications: PN1 aramid fiber honeycomb uses include boat hulls, auto racing bodies, train car panels, ship panels, ground transportation structures, military shelters, ground antennas and special purpose panels. 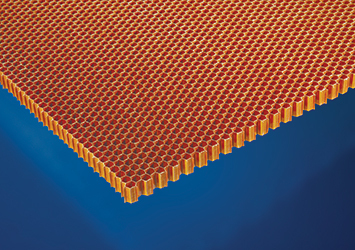 PN1 aramid fiber honeycomb is available in sheets, blocks or cut to size pieces in both regular hexagonal and over expanded (OV) cell configurations. NOTE: Special dimensions, sizes and tolerances can be provided upon request.